Beat cream cheese in large bowl with electric mixer until creamy. Add chocolate, sugar and vanilla; mix just until blended. Gently stir in whipped topping; cover. Refrigerate 30 min. Trim rounded tops off cakes. Place 2 of the cakes, side-by-side, on parchment-covered wire racks. Spread lightly with small amount of the cream cheese mixture. Stand remaining cake on one of the short ends; cut diagonally in half to make two triangles. Place triangles on iced cakes in shape of pyramid to resemble roof as shown in photo. Spread entire cake with remaining cream cheese mixture. Transfer cake to serving platter. Press chocolate chip cookies onto roof to resemble roof tiles. Press chocolate-covered cookie sticks onto side of house for the door and top of house for the chimney. Decorate with chocolate pieces as desired. Store in refrigerator. This delightful cake is fun to decorate but extremely indulgent, so enjoy it only on special occasions. 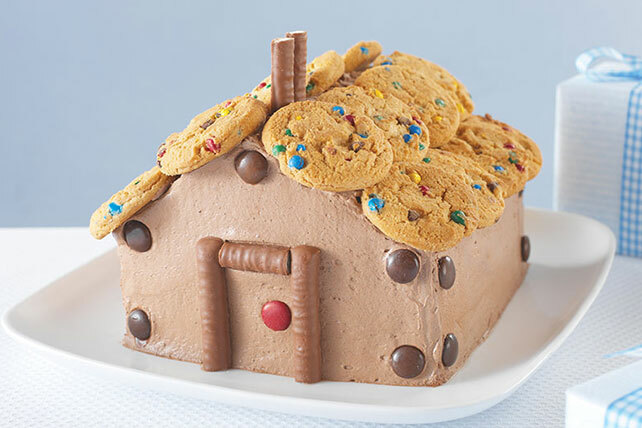 Make this a family project by decorating this edible house with the kids!